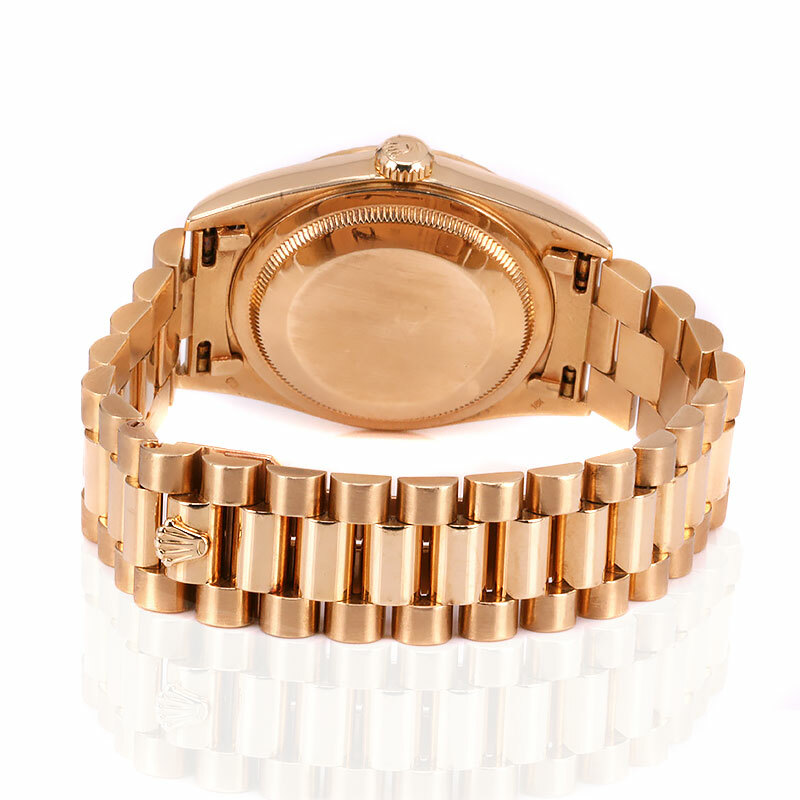 Product code: W1471 Categories: Sold Items, Sold Rolex Watches. Here is a great looking 18ct diamond dial double quickset Rolex Day Date President 18238 that is in superb condition and will always get the attention that it rightly deserves. Since its launch in 1956, the Rolex Day-Date “President” has become synonymous with success and has a look to it that looks so elegant at the dinner table and so powerful in the boardroom. This particular model is known as the double quick set and has the distinct advantage over its predecessor in that changing both the day and the date is incredibly easy. Whereas the 18038 has the quickset function for the date only and changing the day is done by turning the hands forward 24 hours, for this model both the day and the date can easily be changed by turning the crown forward or backwards respectively. Measuring 36mm across plus the Rolex screw down crown, this model does of course have the fabulous diamond dial with both baguette and round brilliant cut diamonds. Inside is the 31 jewelled Rolex automatic calibre 3135 that has been completely serviced, runs perfect and comes with our twelve month warranty. Not only is the movement is great condition, but so is the band with no evidence of flex showing how little wear this watch has had. The ultimate Rolex to have on your wrist once you have reached that pinnacle in life. Tags: Rolex 18238, Rolex President. Since its release in 1956, the Rolex Day Date “President” has always remained a sought after Rolex model. The Rolex Day Date became one to represent success and accomplishment as it was worn by some very influential people. Becoming known as the “Presidents’ watch” as several US presidents wore one. These included US Presidents such as Dwight Eisenhower, John F Kennedy, Ronald Reagan, Richard Nixon. The Rolex Day Date has also been worn by Winston Churchill. Initially the tern “President” referred to the type of bracelet attached to the Day Date, however it soon came to commonly refer to the entire timepiece. The Rolex Day Date 1803 was introduced in 1961 and over the years has undergone some changes. 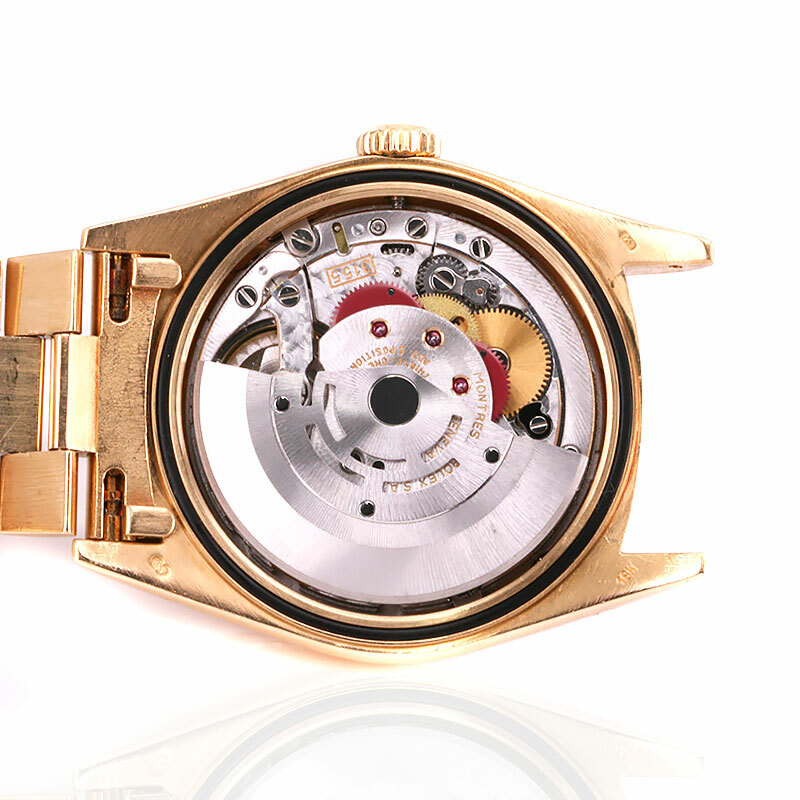 Most notably with the movement, and until recently a now larger watch case. This particular model is known as the double quick set and has the distinct advantage over its predecessor in that changing both the day and the date is incredibly easy. Whereas the 18038 has the quickset function for the date only and changing the day is done by turning the hands forward 24 hours, both the day and the date can easily be changed by turning the crown forward or backwards respectively.